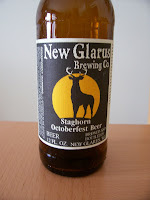 ...I'm drinking Staghorn Octoberfest from New Glarus Brewing Co. in New Glarus, Wisconsin and it's pretty darn tasty. A hazy amber-orange lager, this bottle of Staghorn does not disappoint. The nose is definitely full of malt aroma with a hint of caramel corn. Not the best aroma in a beer, but Staghorn lacks in aroma, it makes for in taste. Toasted and caramelized malts mix with just a touch of hops, paving the way through some sweet and tawny malt flavors towards a fairly dry and somewhat tart finish. A nutty character emerges as this lager warms up, making it even more enjoyable. The complex flavors are somewhat difficult to describe, so I'll just sum up by saying that this is definitely my favorite fest beer of 2007. I've finally found some Capital Special Pilsner. I regretted not picking some up at the brewery after a visit back in November. Silly me thought that I could find some of this great beer around Chicago, and I did find some, but I had to look pretty hard. I ended up finding this beer at the Binny's in Des Plaines at the corner of Golf Road and Elmhurst Road. 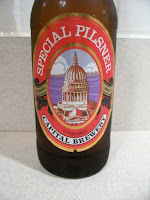 I believe that Capital Special Pilsner is one of the best pilsner-style beers in America; certainly the Midwest. When fresh, this beer has an incredible hop aroma and spicy taste that is built upon a foundation of crisp pilsner and toasted malt. The finish is clean and fairly balanced with just the right amount of lingering hop bitterness. The body and the color are both light; making this a very refreshing beer. Every year I look forward to the coming of Christmas beers. 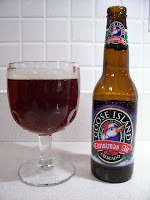 In recent years, I've been particularly fond of the Christmas Ale from Goose Island Brewing Co. of Chicago, Illinois. This mahogany ale has a wonderful spicy, hoppy aroma that covers up the scent of all the toasted and caramel malts in this brew. Hearty pine and citrus hops play well with the flavors of caramel and lightly roasted malts. The finish is assertively bitter (the brewery says 50 IBUs), but as the hops fade, the sweetness of the malt lingers. The brewery says the flavor of this beer will continue to improve over five years and I believe 'em. This beer is well-hopped, but I think I can detect some faint spices (other than hops) in the background. I'd certainly like to see how this beer might change. My guess is that the hops might fade and some hidden complexity (masked by the hops) might surface over time -- at least that's been my experience with beer that I have homebrewed. I made an extra hoppy barleywine a few years ago and it was interesting how the hop flavor mellowed over time, the hops becoming less aromatic, but their flavor mutating into more of an earthy, woody character instead of the original citrus and pine. You'd think that a brewery called New Holland might be interested in creating variations on Dutch beers (lagers, Trappist ales, etc. ), but the New Holland Brewing Co. of Holland, Michigan offers a wide variety of ales that seem to be more inspired by American and British brewing traditions than the Dutch. For starters, lets look at one of my favorite New Holland beers; Mad Hatter Ale. Visually, it's an appealing ale. The white head on top of this deep golden ale settles to a fine layer of foam leaving bits of sticky lace on the sides of my glass. The Hatter is an intensely hopped ale (or India Pale Ale as some purist would say) that has a very floral aroma and a bright peppery, fruity (pineapple?) flavor enveloped in what tastes like a single pure malt. The finish is resiny hoppy and fairly memorable, with a bit of grapefruit and that pineapple again. A decent India Pale Ale for sure. I visited the New Holland brewpub in downtown Holland back in June of 2004. A few years earlier I had visited the brewpub in its original location, adjacent to the brewery, in what seemed like a garage. It was kind of a care-free, hip location and I kind of missed its Bohemian feel when I finally checked out the new place which seemed more like a standard brewpub (kettles and other equipment on display, nice wood bar, dining room, etc.). The new place seemed to pay homage to the old by serving the beer in a mason jar with a handle. We happened to stop by the new brewpub during "Hatter Days", which featured (of course) Mad Hatter India Pale Ale served "hatterized" or served on draft and pushed through a water filter filled with whole leaf hops. Impressive. The picture above and to the left shows me admiring the contraption. We sampled some of the "hatterized" Hatter and it burst with some much soporific hops that it almost knocked me out. After a few batches that seemed to be infected, I got up the courage to brew again a few weeks ago, but not before replacing some of my equipment and thoroughly cleaning and sanitizing it. The only equipment I replaced was my bottling wand, which I really didn't replace, but got rid of altogether. Now I'm just using a piece of hose that I fit onto my bottling bucket. I cleaned all my equipment with B-Brite then sanitized some parts with One Step and others with a dilute solution of Iodophor. I brewed a spiced porter and it seems to have turned out okay. The spices I used included licorice and juniper berries. I added an ounce of licorice pieces with about 15 minutes left in the boil along with an ounce of crushed (dried) Juniper berries. The licorice pieces didn't really dissolve like I thought they would, so I fished them out with a slotted spoon at the end of boil. I didn't strain the wort since I wanted the fermenting wort to be in contact with the berries. The other ingredient included four pounds of Alexander's Pale liquid malt extract, one pound of Munton's dry malt extract, one pound of chocolate malt, one pound of Victory malt, a half pound of 150L Crystal and a half pound of brown sugar. The hops were all Simcoe, with a half-ounce added at the start of the 60-minute boil and a quarter-ounce at 30 minutes. This mixture was fermented with Wyeast 1028XL. Fermentation started in about eight hours. The wort fermented for about eight days in my primary fermenter, then I transferred it directly to the bottling bucket. The beer was packaged in one party pig and 12 22-ounce bottles. I added a half ounce of dry Simcoe hops to the pig. So far, after about three weeks, the beer tastes good. I've just tasted it from the party pig so far and the dry hops are pretty evident. There's a definite pine scent from the hops that is noticeable in the nose and on the palate. Beyond that, the beer has a roasted coffee flavor mixed with an almost burnt caramel sweetness, followed by the sting of black licorice and then a rather dry, but licorice-accented finish. A rather delicious porter, that is rather sessionable, which is sort of my requirement for "pig" beer. There's something about beers poured from a Party Pig; I think it has to do with how the beer is pushed through a diffuser when it's tapped. I've noticed that the pig makes my beers (especially the darker ales) taste like they've been tapped from the cask. The carbonation is very smooth much like in naturally carbonated, cask-conditioned ale. 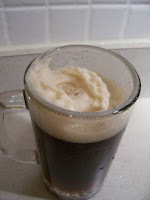 Sometimes, about half-way through the pig starts pouring mostly foam, but waiting for the foam to settle is a small price to pay for a compact method of having cask-conditioned ale at home! I came across a beer today that I haven't seen in awhile. A Belgian beer from Van Honsebrouck that I've enjoyed on and off through the years called Brigand. I picked up a single 33-cl bottle which I enjoyed this evening at home. This particular bottle had plenty of carbonation that formed a dense bright, white head that slowly fell living a thin layer of bubbles and thick collar. The aroma was sweet and accented by grain, much simpler than I remember. Faint bits of floral hops mixed with sweet malt and a fairly sugary sweetness. The hotness of alcohol was present in the finish with was dry and fairly short, leaving the heat of alcohol and a slick sensation. The mouthfeel was very smooth and accented the somewhat clean flavor for a Belgian ale. A decent beer, but not the same complex ale that I enjoyed in the early 1990s. I discovered this beer many years ago in Mokena, Illinois, at a store on U.S. 45 called Miska's Country Food & Wine (if I remember correctly). The place had a ton of craft and imported beer with a lot of it in coolers. They seemed to always have something new and interesting. One of these new and interesting beers was Brigand. It came in a 750-ml corked bottle with cool artwork of a Brigand (a historical term for an unsavory type of mercenary or outlaw), but what really got our attention was the price: $3.99 a bottle. We were quite happy to pay this for a Belgian, but also suspicious of the contents of said bottle. Aside from the price, the other quality of this bottle that piqued our interest was a streak of yeast that was stretched down the sides. 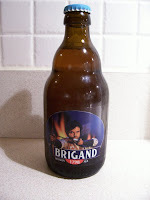 My first impression of Brigand (back in 1993) was that it had a rustic, fruity character. The hop character was somewhat spicy, but muted, and the strength of the beer was rather evident. The beer's rusticity was represented by a profound earthy, yeasty character. Overall, we were very impressed with the beer's complexity and the yeasty character suggested to us that Brigand would be a good ale to cellar. I decided to keep some bottles of the beer in my basement (not quite a cellar), but most of these beers would be consumed within a few months time. However, one particular bottle was set aside and I managed to keep this bottle for about six or seven years. We learned these $3.99 bottles were marked down because they were considered old. How did we know this? Well, the brewer printed the bottling date on the cork of each bottle. Most of the bottles I remember enjoying back in the early 1990s were bottled in 1989 and 1990. Now, fast forward to New Year's Eve 1999. Remember that single bottle of Brigand that I stashed? We popped the cork on NYE 1999 with the assumption that bottle was filled in 1989 or 1990, so it would be about 10 years old. I was worried the beer would be flat or undrinkable. It was neither: it had plenty of carbonation, it's rusticity had significantly mellowed, yet the complexity remained. The date printed on the cork was April 1989 (if memory serves). It was a sublime beer that was worth the wait. I stumbled upon a very dry Bohemian Pilsner called BrouCzech. I found it at Trader Joe's the other day for around $6 a six-pack. Apparently it's made at the Nova Paka brewery in the Czech Republic. Their seems to be a decent webiste for the beer, but I'm not finding much buzz about the brand elsewhere on the Internet (RateBeer, BA, etc.). BrouCzech Pilsner is a deep golden, almost amber pils with a really wonderful nose that exhibits a combination of grassy, spicy hops and an almost cinnamon-like aroma of toasted malt. It's a very smooth lager whose Saaz hop character reminds of what Pilsner Urquell used to taste like some years ago. This is a beer that tastes so pure I swear I can taste the minerals in the water the brewery used for brewing. I'm really diggin' this brew this evening. Kudos to the Downers Grove Trader Joe's for stocking this beer! I recently made a trip to south central Wisconsin and stopped in (just before closing time) at the Capital Brewery. I hadn't been there in a few years and was rather impressed with myself that I found the place. I had a couple of friends with me who hadn't been there before and I really wanted them to see the place. We had planned to maybe take a brewery tour, but instead we just checked out the tasting room and gift shop. We had very delicious brewery fresh pints of Capital Special Pilsner. We didn't feel the need to take any Capital beer home with us as we're lucky enough to find a good range of Capital beers in the Chicago area. However, it's been a couple weeks since our trip and I've been unable to find any Special Pilsner. I finally broke down and bought some Wisconsin Amber, sort of thinking that I was settling for something less than what I really wanted. I don't know why I was so wary; I'm thinking that I had a not-so-good bottle of Amber somewhere and that turned me off. So, I picked up a single bottle as part of mixed six-pack of beer at Trader Joe's and I have to say I wish I would have picked up a whole six-pack of the Amber; it's a very tasty lager. It's certainly not brightly hopped as the Special Pilsner, but it strikes a tasty balance between crisp toasted malts and hops. I wish more American craft brewers produced lagers as tasty as Capital. I'm tasting Dark Horse Black Bier on a Black Friday. This very dark Dark Horse brew pours pitch black and bit shy in the carbonation department. I'm not surprised, as this is one thick brew -- thick and alcoholic -- as I notice that this has "legs" much like a fine wine. The aromas are intense with black currants and dark chocolate along with the suggestion of port wine. The fairly how carbonation keeps this beer smooth as silk, black silk with magnificent cocoa and espresso flavors along with a good smack of hop and roasted grain bitterness. This beer comes across much bigger than it's 7.5 percent alcohol by volume suggests. This is a very delicious black beer that drinks more or less like a Russian Imperial Stout, but the brewery is coy about style, simply calling it a black ale. I like the fact that the brewers didn't feel the need to call this a stout or porter, they simply wanted to make a really dark, black ale and that's what they called it. I felt the urge to post an update on a beer I wrote about in my last post: Heavy Handed IPA from Two Brothers Brewing Co. in Warrenville, Illinois. I happened to find another batch or lot number of this wet-hopped ale. The particular version I found is hopped entirely with Cluster hops. The Cluster hop version of this beer looks the same; slightly amber color, good bright white foam with good head retention. The aroma is earthy and oddly floral, probably fruiter than the Willamette hopped version that I tasted in my last post. The Cluster version tastes fruiter and sweeter than the Willamette, too, (at least in the middle) with a very late and muted burst of hop bitterness. The hoppiness and bitterness builds in intensity with each sip. A very tasty version of this beer, that I probably appreciate a little more than the Willamette version and I'm not sure why -- possibly because of the earthy and floral (less spicy hops). 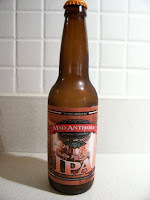 Here we have a beer brought back from Indiana by my friend Ryan called Mad Anthony IPA. It's an orange-hued IPA with not a lot of carbonation, but the initial one-finger or so of head leaves a persistent layer of fine bubbles -- this is a fairly visually appealing ale. The aroma is rather delicate, fruity and mildly hoppy. Frankly, I'm not too impressed with it. Spicy, hoppy flavors that lead to a tangerine-laced finish are interesting, but certainly not over-powering. The bitterness is right for a smaller American-style IPA. Any yeast flavor component seems over-run by the hops. The finish is clean, a touch sweet then bitter. Mad Anthony has a good, clean IPA here and one I wouldn't be afraid to revisit, but not necessarily seek out. 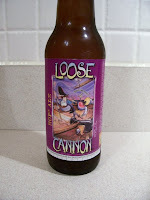 Loose Cannon (Hop3 Ale) is an IPA from Clipper City Brewery in Maryland. This was another brew picked up in Indiana. The Loose Cannon poured pretty nicely with good carbonation and a couple fingers of foam. The head falls pretty quick though, leaving an almost flat looking ale. The fruity (orange?) hop aroma was pretty intense and noticeable a few inches away from my glass. Loose Cannon is a rather sweet and fruity golden-hued ale that seemed a touch too sweet in the finish to be considered an IPA. The body is fairly light, enhancing drinkability, but causes me to lose interest. There was no real hop bite in this beer's finish, just some light spicy hops and sticky sweetness along with the warmth of alcohol, detracting from the enjoyment of this beer. This is one I wouldn't mind giving a second chance, but I wouldn't seek it out. Judging by reviews on Beer Advocate, I'd like to try this one on tap. Heavy Handed IPA is third up in this trifecta of extra hoppy ales. 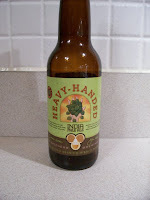 Heavy Handed is brewed by Two Brothers Brewing in Warrenville, Illinois. It is a "wet hopped" IPA; meaning it was brewed with fresh hops that were not kilned (dried) before adding them to the beer. Heavy Handed is not exceptionally bitter beer in terms of modern "hop bombs" -- the beer is brewed to a bitterness of 62 IBUs. That said, there is a lot of hop aroma, flavor and lasting bitterness in this amber-hued IPA. 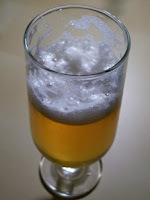 It's a pretty beer, too, with white head of foam that settles slowly, leaving some lace down the sides of the glass. The hop aroma is complex; woody, herbal and very pleasant. Spicy, resiny, almost stikcy hops dominate the palate with caramel malt flavors softening the sharpness of the hops. The finish is bitter and rather long and just a touch thick. The mouthfeel is smooth and a touch slick in this full-bodied IPA that is probably the beefiest (least dry) of the bunch. It's definitely worth noting that this beer is produced in different batches each a different hop. The type of hop used can be determined by discerning the lot number from the label. My six-pack was part of lot no. 2547, which was brewed with the Willamette variety of hop. I picked up a sampler pack of Sam Adams the other day that included two each of the Boston Lager, Boston Ale, Brown Ale, Black Lager and Honey Porter and Scotch Ale. I hadn't tasted the Scotch Ale and Honey Porter in years; the inclusion of these two beers in the pack is what really got me interested in it. Despite my interest in the Scotch Ale and Honey Porter, the Brown Ale was probably my favorite and is pictured. The Scotch Ale seemed to fizzy and thin-bodied with a slight banana-like phenolic character that seemed out of place. I suppose this character came from the use of peated malt, which I've read can add some phenolics. The Honey Porter came across much more like I remembered it. The honey sweetness is an interesting, contrasted with the dark malt flavors of chocolate and roasted coffee. The Black Lager seemed to have more of the roasted coffee character, but was smoother than the porter and less sweet (no honey), so I liked it a touch more than the porter. I certainly wouldn't turn down the porter if it was offered to me. 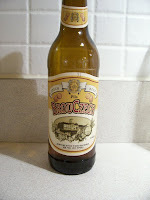 Of course, the Boston Lager had the most hoppy character of all the beers and was very sessionable and very tasty. The Boston Ale wasn't quite as hoppy at first, but the second bottle (served a bit warmer I think) had more of a recognizable English hop character. Nothing outlandish mind you, but a solid enough hop character to balance out the sweetness of the malt and add a woody, slighty resiny hop taste. Getting back to the beginning and the brown ale: this was the most suprisingly good beer of the pack. Not necessarily the best, but most the surprisingly good. First, it poured beautifully, with a huge rocky head. Next, it delivered a wonderfully complex flavor of pure malt, nuts, chocolate, figs and spicy hops with a creamy mouthfeel. A very sessionable ale that also stimulates the tastebuds. The only caveat attached to tasting this beer is that, to me, it is strictly an autumn brew. I don't really drink brown ales other than in autumn. The flavors that most brown ales offer just seem to suggest autumn - don't know why - but maybe it's because it was the time of year my grandmother would put out bowls of nuts to snack on; filberts, Brazil nuts, almonds and walnuts which are precisely the flavors one can find in a good nutty brown ale. I bottled the Roastaroma Ale (sort of my take on an old Charlie Papazian recipe) yesterday with some decent results. The beer smelled and tasted okay after sitting for 18 days in the secondary. This fermentation was much longer than I intended; other parts of my life got in the way of my homebrewing and frankly, I was a bit scared of what was happening to my beer as it continued to ferment at temperatures between 80 and 83 degrees. I ended up filling 24 22-ounce "bomber" bottles of what could turn out to be an interesting brown ale. Perhaps the only flaw I noticed was a light green apple aroma. This could be something bad like acetaldehyde, but it may also be something that age may subdue. I guess most importantly, the batch appears to be devoid of really obviously nasty off flavors. In other news, it seems an infection caught up with a saison-style beer I brewed back in late July. This is really disappointing because the beer seemed quite good at first. In fact, I raved about how good it tasted and posted a picture in an earlier blog entry. Lately, the bottles I've been opening have been prone to excessive foaming and I've noticed the tell-tale ring around the neck. I used some of these bottles for my most recent batch, but scrubbed and cleaned them with B-Brite, then rinsed them, then sanitized them with a Iodophor solution. However, the tragedy has already been magnified, as I re-pitched the saison yeast for a cherry ale that I made a few weeks ago and sure enough, many of these bottles have a ring at fill level and some even have a milky looking substance floating on top of the beer. Reading some other blogs and homebrew forums, I'm thinking it's time to get some new siphoning equipment and a new bottling bucket. It's been to damn hot the past few days. So damn hot I had the taste for some lingering summertime brews, so I tried a couple summer ales from New Belgium Brewing Co. of Durango, Colorado. 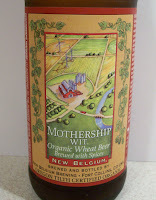 I picked up single bottles of Mothership Wit and Skinny Dip. Of course, New Belgium is famous for its Fat Tire Amber Ale, which seems to have a huge cult-like following. I enjoy an occasional Fat Tire Amber, but it's not my favorite brew. That said, I wanted to try a couple of the brewery's other beers and see how they compared. I found the Mothership Wit (pictured to the right) to be an amazingly pale beer, no doubt due in large part to the brewery using large amounts of unmalted wheat as an ingredient. As I marveled at this beer's near Bud Light paleness, I couldn't help but wonder if it would also taste like Bud Light. No, sir. Mothership Wit may be cloudy pale in color, but it is thankfully no Bud Light. It is a refreshing Wit bier with just the right amount of spices and yeasty complexity. Spicy citrus flavors and very light (almost watery) body make for the perfect ale on an 85 degree day. Overall, I would prefer the Mothership's spiciness over the Skinny Dip's Cascade wheatiness. I remain eager to try more New Belgium beers. I really love the presentation with the intricate label artwork and custom embossed bottles. Clearly, the New Belgium Brewing Co. is trying to sell more than beer, but a lifestyle, especially with it's dedication to cycling and the environment (harnessing wind to power the brewery). Although clearly inspired by Belgium, the New Belgium beers come across much cleaner tasting then the real deal. I continue to wonder if there is a New Belgium brew that brings a little more of the funk that many real Belgian ales offer. I'm optimistic about the brown ale (see previous post). I racked to the secondary today, as I noticed that the airlock was no longer bubbling and the gravity was seemed a few points to high. The beer was quite murky, so there's still a lot of yeast suspension that I suspect will ferment the beer so more in the secondary. I'm hopeful that I'll be able to bottle in about five days. The sample I poured off to take a gravity reading was very murky brown, smelled a touch sour and quite spicy (I could detect the spices from the Celestial Seasonings Roastaroma tea that I added at the end of the boil.) I could taste the spices, too. I couldn't detect any of the sulfur that was produced in the early stages of fermentation. The hops were kept in check. The brown ale flavor was good; mostly caramel flavor with a roasted coffee edge. The finish was tart, but also a touch bitter. I'm keeping my fingers crossed! I brewed a batch of brown ale the other day and I'm deeply regretting it. It hit 90 degrees (F) today and my fermenting space got up to 82. I had pitched some Safbrew T-58 and it's throwing some sulfurous aroma, not stinking up the room bad, but noticeable. I've read up on this yeast and it seems like the sulfur smell is fairly common for this yeast. Also, I've used the T-58 before in wheat beer with some tasty results, so I will relax and have a homebrew....which doesn't help me relax. Why does having a homebrew not help me relax? Well, because my two saison-style brews that I've made this past summer and they're both not appealing to me. The first batch was brewed back in May and tasted a touch too sweet up front and too bitter in the finish with some banana-bubblegum esters in the nose. It wasn't too bad, but seemed a bit chewy. This batch as since improved in one regard; the esters have dissipated somewhat, the finish is drier, but on the other hand, the finish is bitter, hot and a bit solvent-like. I used Wyeast XL 3726 for this batch. The second batch I brewed with Wyeast XL 3822 (Ingelmunster Ale) and the first case tasted great. I added some lemon verbena to add a citrus-lemon character and it added an interesting character to the beer. The second case, however, is not as tasty: the citrus flavor from the lemon verbena has faded, the beer has become very dry and some of the bottles have been over-carbonated. So, perhaps you could see how these earlier wayward summertime brews might have me concerned about my latest attempt at hot weather brewing. I have had success in summers past brewing some tasty ales in my hot third floor condo, but after this year I'm really looking forward to some winter weather and cooler (under 80 degree) room temperatures! As I've mentioned in earlier post, my friend Ryan recently brought back a bunch of beer from the Boulevard Brewing Co. in his boyhood home of Kansas City. Boulevard beer is an old favorite that's been out of my reach for quite a few years. I first tried Boulevard Irish Ale while I was in college and later tried the outstanding Bully! Porter. Since I've had these beers before, by good friend Ryan (who also enjoys Boulevard beer) brought back some of brew which haven't had the pleasure to taste. Tonight I'm tasting two beers from a mixed case that are both brewed with wheat. First up is Zōn; a refreshing, straw-colored, cloudy wheat beer brewed with orange peel and coriander. According to the neck label on the bottle, Zōn is the Flemish word for Sun and this beer definitely is one to be enjoyed when it's hot and sun is shining. The nose is grassy and citric with very slight whiff of sour. The sip is lightly spicy, a touch bready and lightly spicy. I make certain to rouse the yeast at the bottom of the bottle in hopes of more complexity, but the character of the beer doesn't change much when more yeast is added to my glass. The mouthfeel is quite soft, with the wheat no doubt contributing to this character. The bitterness is very low (the Magnum and Simcoe hops the brewery says it uses in the beer must be added very sparingly) and this ale finishes slightly sweet and slick. This is a beer that is easy drinking, but I think it could be made better by being just a touch drier. 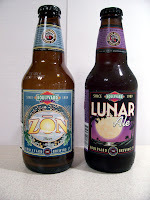 Overall, Zōn is not bad Belgian-style wit (meaning: white or wheat) ale. Next up we have Lunar Ale, a light brown wheat-accented ale with some ruby highlights. The aroma is fruity (I'm thinking figs), but there's a whiff of roasted coffee that is intriguing. At first glance I suspected that I'd be tasting something like a dunkelweizen or a weizenbock, but Lunar Ale is something a little different. The typical banana or clove German wheat beer yeast esters are absent (maybe a hint of clove), but the roasted coffee is what really grabs my attention. There's the caramel-wheat malt flavors of a dunkelweizen, but there is a roasted coffee accent that shows up again on the palate that I haven't tasted in other dunkelweizens. The yeast provides some tartness that makes this beer even more interesting. Finally, a fruity, but dry finish enhances the enjoyment of the beer and increases the drinkability. Back in June I brewed a Belgian Saison-style of beer using Wyeast XL 3822 Inglemunster Ale. The yeast seemed to work quite well, although it wasn't quite as tart as I had thought. I saved the yeast from that batch (I harvested the yeast from the secondary) and saved it in a flask in my fridge. I brewed another beer with that yeast a couple weeks ago, which I've since bottled. This new beer is a light brown ale made with pale malt extract and a mini-mash of chocolate and aromatic malts along with torrefied (puffed) wheat. I used Hallertauer Hersbrucker hops for bittering. The hops were very low alpha acid, about 3.3 percent and I added one ounce at the beginning of the 60-minute boil and another ounce at 30 minutes into the boil. I racked 3.5 gallons of cooled wort to my plastic fermenter, then topped up with a bit too much water, before adjusting the amount and adding one gallon of pasteurized Montmorency tart cherry juice. I used a sanitized mug to scoop up about about a quart of wort before adding the cherry juice so that the final amount of wort with the cherry juice would be exactly five gallons. I put the extra wort in a sanitized growler and added a little bit of Ingelmunster Ale slurry to it. It fermented just as quickly as the rest of the wort. I bottled it as sort of a control sample of the brown ale without cherry juice. I filled a couple 12-ounce bottles with this "uncherried" brown ale and then transferred the yeast slurry from the growler into a sanitized flask that I may pitch a third time in another future batch of beer. This is the first time I've made a brown ale with cherry juice, but I've made a stout with the same type of tart cherry juice before and it turned out great. My original thinking was that the tart cherry flavor might be more intense in a brown ale and so far I was right, although the yeast I used, Wyeast XL 3822, may add some tartness, too. So far, I have a tart (if not sour) brown ale on my hands. I wouldn't call it a cherry beer, but more of a sour brown ale or "Oud Bruin". The one gallon of cherry juice didn't seem to add much pink or red color to the beer or cherry flavor, but it's kind of hard to tell at bottling time when there is so much yeast in suspension. I was a bit surprised at how quickly this beer fermented, so we'll see if I have any bottle bombs or volcanoes, but my gravity readings told me that the beer fermentation achieved about 77 percent attenuation, which is about right on for the yeast that I pitched. I used to drink Boulevard beer a lot starting about 12 years ago when I as a college student in Western Illinois. Boulevard Pale Ale is a respectable pale ale and I wish the Illinois distribution reached the Chicago area. Although the aroma reminded me a bit of Berghoff Pale Ale (which is brewed in Wisconsin and distributed in the Chicago area), I think Boulevard's pale ale is a bit more refined than the Berghoff and closer in taste and body to Sierra Nevada Pale Ale. The packaging is pretty refined; as this six-pack comes boxed with some nice artwork. The beer is described as bottle-conditoned, and I like that, as bottle-conditioned ales tend to have a bit more complexity than highly filtered ones. This golden pale ale starts pours with plenty of carbonation and a bright white head. I can't help but notice the hoppy, floral aroma. This beer has a good malt saltine cracker-like malt flavor, a slight fruitiness (almost like Juicy Fruit gum) with some pleasant tasting hops. The finish is bitter, but not powerfully so, with just enough hops to let you know you're drinking an American Pale Ale. Perhaps a bit thin for the style, which I suppose makes it a good pale ale for warm weather quaffing. Boulevard Dry Stout is a tasty session ale of a stout. According to the brewery, the dry stout has the lowest alcohol by volume among all their beers. The stout pours with plenty of carbonation that forms an off-white head that settles to thin layer with a fine bead when roused. The aroma is full of dark chocolate with a touch charcoal. When warmed up close to room temperature, the Dry Stout is silky smooth. Wonderful dark chocolate and hints of espresso coat the tongue paving the way for a dry finish with roasted edge and solid bitterness. A fine stout indeed. I'd heard that Goose Island Brewing Co. in Chicago was going to release a Harvest Ale this year instead of an Octoberfest. I've been on a bit of amber ale kick lately, so I had to try it. The Harvest Ale is a good looking amber ale (about the same color as the old Octoberfest) with a fairly thick white head that falls slowly, but never quite disappears, leaving a little lacework on the sides of the glass. I'm impressed with the leafy hop aromatics and how they mingle with aroma of what seems like toasted and caramel malts. The sort of Vienna malt character that seems fitting for an Octoberfest is present here, but with what tastes like English and American west coast hops mixed together for a spicy, piney combination. The bitterness is pleasant and just right for this rather sessionable beer. Perhaps a touch thin, but otherwise a delicious new seasonal brew from Goose Island. 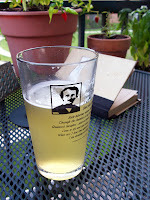 I recently had the opportunity to try a new beer from St. Louis (no, it's not made by Budweiser). The beer is Schlafly Pale Ale. Thanks go to my friend Ryan for picking up a the bottles on his way to Kansas City. As you can see, the Schlafly Pale Ale (pictured to the right) is a light amber pale ale with incredible head retention. It is definitely more of an English-style pale ale, with a robust malt character and fairly thick, silky mouthfeel. Spicy hops up front on the palate increase the enjoyment of this ale. An English cookie-like maltiness is very pleasant and the right amount of slightly citric hop bitterness puts the hops and malts pretty much perfectly in balance. About halfway through this serving of ale, a fairly thick Brussels lace has coated one side of the glass. Schlafly has a very pretty, pleasant tasting pale ale here. In the coming days I'll be sipping my way through an assortment from the Boulevard Brewing Co., very appreciatively brought back by Ryan to northeastern Illinois (where Boulevard was once distributed) from its source in Kansas City. This week Central Waters Ouisconsing Red Ale spars with Ale Asylum Ambergeddon Amber Ale. First up is the Central Waters, with deep amber-red hue and an impressive, extremely persistent, quarter-inch thick white head. The aroma of this beer is probably best described as fruity. I know that's vague, so I'll try and elaborate; I'm thinking about berries here, sort of light raspberry or blackberry fruitiness combined with caramel malt flavors. The texture of this beer is absolutely luxuriously smooth and fairly full-bodied, with the juicy sweetness of the malts balanced by the spicy hop finish. 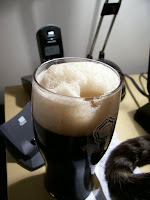 The dense, foamy head that I mentioned earlier persists after several sips and leaves some lace down the sides of the glass. This beer is one of the most delicious amber ales I've had, although frankly, it's drinking more like an outstanding British bitter than an American amber ale. Overall, the Central Waters Ouisconsing Red Ale is very tasty and seems very fresh. The Ale Asylum Ambergeddon certainly sounds impressive, perhaps foreboding. It pours pretty nicely, with not as dense of a head as the Central Waters, but as the head falls, it does leave some lace. The nose is a mix of leafy spicy hops and sweet caramel malts. The Ambergeddon seems not quite as thick as the Ouisconsing from Central Waters. It has some of the same caramel malt flavors, but with a hint of chocolate (just a hint). It is less fruity, more hoppy with a drier finish. The finish is just a bit warming, which has me thinking that this amber ale is quite a bit stronger than the Central Waters. I like both beers. At least tonight I prefer the Ouisconsing Red Ale due to its "sessionability" at 4.8 percent alcohol (as indicated on the label). The ultra smooth character, fruity complexity and moderate bitterness makes it very drinkable, but not boring. On the other hand, the Ambergeddon offers a good punch of hops with a delicious hoppy (almost peppery?) finish, but seems rather strong, as I perhaps downed it too quickly not knowing the alcohol content -- I guess I should have known it was strong what with the skull on the label and all, huh? Rumor has it that the Ambergeddon is 7.5 percent alcohol, so I can't see having more than couple of these in a session without being too intoxicated. Although I bought the Ambergeddon in Madison not too far from the brewery, judging from reviews on Beer Advocate I'm thinking my bottle might not be at its peak freshness -- some of the complexity and hop wallop reviewers on BA describe seems to be missing. I'm back at Trader Joe's, buying food and of course, beer. I'm entranced by the pretty beige and red antique-looking labels on the little green bottles of Salzburger Stiegl. I've noticed the six-packs before, but I've always balked at the $10 price tag. I've had Stiegl on tap before and it was fairly memorable as a smooth, balanced lager. Perhaps that's what was really enticing about those little green bottles, tucked inside their protective cardboard jacket. I had the taste for a smooth, refreshing, lager and it turns out that Stiegl delivered what I wanted: a light golden lager that is neither too sweet or too bitter; malty or hoppy with a soft mouthfeel. This Stiegl beer is a smooth drinker; a very quaffable session beer. So, why then, am I paying $10 for six 11.2-ounce bottles of this stuff? I'm mostly enjoying my Stiegl six-pack, but at $10 a six for a lager beer, I expect to wowed with a lot of complexity (think double bock) or treated to a wonderful hop aroma and flavor. The Salzburger Stiegl is neither complicated or wonderfully hoppy (the aroma is slightly grainy), so I feel a bit cheated. I'm not calling this the Labatt Blue of Austria (as the folks over at A Good Beer Blog have), but for $10 I'm going to buy some König or some Jever. A few weeks ago, the Trader Joe's closest to my house expanded its beer selection. Now I can mix and match among breweries such as Unibroue, Sierre Nevada, Goose Island, Three Floyds, Pyramid, Great Lakes, Dogfish Head and Anchor. I recently made a a little hoppy sampler with some Dogfish Head 60-minute IPA, some Goose Island India Pale Ale and a bottle of Liberty Ale from Anchor Brewing. 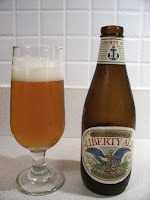 First produced in 1975 (I thought as a Christmas beer, but Anchor's website indicates that it was brewed to commemorate the bincentennial of Paul Revere's famous ride), Anchor Liberty is a classic hoppy ale and was THE hoppy ale for quite awhile until other craft brewers started brewing their own hoppy beers. Anchor Liberty was probably my first hoppy, India Pale Ale type of beer and I imagine it's inspired a lot of other craft brewers through the years. Anchor's website makes a big deal about dry-hopping, or adding dry hops to the finished beer. It states that the process is rarely used in this country...well, maybe in the 1970s and 1980s, but I think a lot of craft brewers are using dry hops these days. I can't remember exactly my first taste of Liberty Ale, but I know it was at The Cafe in Macomb, Ill. I used to think Anchor Liberty had so much hop flavor that a slight green haze was noticeable. I no longer think of Liberty as the hoppiest ale out there, but it is still a contender, with its pine resin scent and hop flavor mixing well with crisp, yet sweet malt. The white, rocky head (as noted in the accompanying picture) is very appealing. It's a pretty simple beer really, but I think sometimes simplicity is what tastes best. About six months ago I bottled a beer that I was hoping would turn out to be in the style of a Biere de Garde. A few weeks after bottling I thought it didn't taste malty enough to be a BDG and I started thinking of it as a Belgian-style Pale Ale. Since then, it's Biere de Garde features have been coming out. Tasting this beer six months after bottling, I'd say it has some qualities of a BDG (fairly clean, hops are distant), but the mouthfeel is lacking, especially up front. However, what I'm especially impressed with is the appearance: the absolutely rocky, meringue-like head that is created when this beer is poured. I'm willing to bet this had to do with a lot of things: sanitation, the yeast strain, the amount of priming sugar used and the addition of a pound of torrefied wheat to the grain bill. Overall, time has mad me a believer that Wyeast XL 3787 can make a Biere de Garde if given the time. The beer will be phenolic at first, but the esters will fade almost completely away given enough time (about six months, in this case). A complete disaster of a brew session...but a good beer. My last brew session, several weeks ago was a complete disaster. I was too ashamed at the time to divulge the particulars, and defying Charlie Papazian's "Relax Have a Hombrew" mantra, I worried incessantly about the batch. Well, it fermented fine, botting went fine and now I think I have one of my best homebrews ever! The one aspect of this brew (a saison-style with added spices) that is completely blowing me away is the pale color. I've got a light golden ale that is clear and beautifully topped with delicate, lacy foam. The aroma is bright and sunny, with plenty of citrus. You see, the spices I used included the zest of two limes, some lemon verbena leaves and black pepper. I made a tea from the leaves (maybe half dozen or so of them) and added the tea to the end of the boil. The light citrus flavor in the aroma carries over into the flavor of this brew, which couples with the crisp pilsner malt and light Hallertau hops and balanced finish to make for a very enjoyable summer ale....completely by accident! The accident, which may explain the pale nature of this batch, had to do with chilling the beer, transfering it to the fermenter, topping up with cold water and then realizing that I forget to add four pounds of malt extract. I stared the fermenter for a moment and then mustered up the fortitude to take a gravity reading, which read something like 1.030 or lower. I didn't want light beer; I wanted a six percent alcohol saison-style ale. To remedy the sitution I basically made and cooled a second wort with the extract and some additional sugar. Then I poured out about two gallons of the wort in the fermenter and added the second wort back into the fermenter. I'm guessing this dilution process is partly what lightened the color of this brew. All's well that ends well though! I've been into side-by-side tastings lately (read: this week). Tonight I compared North Coast Pranqster Belgian Ale with Goose Island Demoliton Ale. I respect the brewers at North Coast. I love Red Seal and maybe love Old Rasputin even more, but the particular bottle of Pranqster that I enjoyed just wasn't up to par. 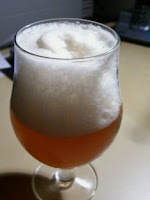 At first pour, the head of foam that formed was discouraging; the carbonation seemed off (maybe an old bottle) and the head didn't generate any Brussels lace. There was something in the aroma that was a bit unexpected...I seemed to pick up some mint, along with a sort of musty cellar smell, plenty of sugary sweetness and some alcohol - not bad I suppose. The Pranqster tasted primarily of sweet malt with some bubblegum fruitiness laced with alcohol - definitely some warming alcohol - despite the beer only being between 7 and 8 percent. The mouthfeel is very smooth, accentuating a bittersweet finish that coated my tongue with sugars. What bothered me about this beer was the sort of flat carbonation and sweetness without any real interesting flavors. I was a bit let down with this beer. I expected something paler and drier, and I guess a little prettier in the glass. Nothing really stands out with this one that would make me a fan of it compared to other North Coast brews such as Red Seal and Old Rasputin. The Goose Island Demolition, on the other hand, was exactly what I want in a pale Belgian-style strong ale. I poured my bottle of Goose Island Demoltion into a tulip-shaped glass, which seemed to emphasize the creation of a beautiful, thick, white head of foam on top of a hazy straw-colored ale. The head fell slowly, leaving a fairly thick coating of lacework behind on the sides of the glass. I moved in to take a sniff and found a delicate aroma suggesting fresh cut hay. An extra few swirls of the glass revealed a subtle graininess, too. I was struck by the light mouthfeel and very light crisp, pilsner malt flavor mixed with a spicy, herbal hop character. All of this suggests high drinkability, but just a touch of warming alcohol in the lightly peppery, dry finish is a faint reminder of the strength of this brew - despite the light, dry, "airy" character of this beer, it is rather strong - stronger than the Pranqster. I liked the Demolotion quite a bit over the Pranqster. 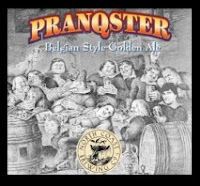 Maybe I obtained an old bottle of the Pranqster and I don't necessarily blame the brewers; it could be that the beer distributor or the store's fault for improperly storing the beer. Without any freshness dating or bottling code, who knows how old the bottle might be? So far now, I have to say I prefer the Demoliton. It was just lighter on its feet, dancing around the seemingly more formidable Pranqster. I've had the Demolition at the Goose Island Clybourn brewpub (1800 N. Clybourn Ave. in Chicago) before and the bottled version is just as good (if note better) than what I recall tasting on draft. The dryness of this brew made it dangerously drinkable and very easy to drink; the light spicy-peppery hops kept it interesting and made for a very refreshing sip - especially during the summer. Now with more frequent updates! It seems blogs are the place to be and here to stay. When I started my website, the Marcobrau Beer Pages back in 1998 there weren't too many people blogging about beer. Heck, there weren't very many people with beer websites. Sites like Beer Advocate, Ratebeer and Pubcrawler were still in their formative years. I started a website about beer mostly because I wanted to create a repository of information about beer in the region where I lived. Other people have certainly come along and improved on this, one site in particular that comes to mind is the Beer Mapping Project. Another reason I started my website was to share my tasting notes with everybody on the Internet. Eventually, I started posting all my tasting notes on Beer Advocate and now the pendulum seems to be swinging back the other way -- sort of -- as I plan on posting more about beer general (tasting notes, pub experiences, etc.) on this blog. This will be in addition to my somewhat regular updates of what homebrews I've got going. I guess it could be viewed as a "if you can't beat 'em, join'em mentality", but I really think it's more about the convenience of blogging versus updating a website. I am, after all, a lazy American. Well...the "Biere de Garde", earlier known as "Belgian Pale Ale" is now acting more like a Saison; with drier character and more spiciness from the yeast and hops showing through. I tried this beer side by side with a French Country Ale from Brasserie Castelain in France. My beer didn't taste anything like the French Country Ale, but the French Country Ale seemed like a true Biere de Garde to me; malty and earthy, with just enough hop bitterness. My beer seemed to have too much hop spiciness and phenols. I think it's still a decent beer, my mom thinks it tastes like Sierra Nevada, (which it does a bit; at least if Sierra Nevada was brewed with a Belgian yeast). Meanwhile, I've brewed another Saison-type beer, using Wyeast XL 3822 Inglemunster Ale (formerly Dutch Castle). I thought this yeast could be interesting in a Saison, and to complement the complexity of the yeast I added about two teaspoons of crushed black peppercorns, the zest of two limes and some lemon verbena tea (freah leaves and about a cup of water). The malt/grain bill included three quarters of a pound of Cooper's DME, two pounds of Briess Pils DME, one four-pound can of Alexander's LME, two pounds of cane sugar, a half pound of Belgian Caravienne malt and a half-pound of torrefied Wheat. I did a step micro-mash of the Caravienne and torrefied wheat. The hops I used included a half-ounce of Northern Brewer pellets at the start of the boil and two ounces of Tettnang plugs; with an ounce added at 15 minutes left in the boil and the other ounce steeped after the stove was turned off. I boiled the wort for 60 minutes. The gravity reading for this beer was around 1.075 degrees Plato. I'm hoping for attenuation in the upper range of this yeast, which would 77 to 79 percent. I've calculated this would give me a beer with 7 to 7.5 percent alcohol by volume. I'm keeping my fingers crossed that this will be a good one. Last night I decided it was time to rack the Saison. The fermentation lock had quieted down and it didn't want the beer to sit in plastic any longer. I checked the gravity and it fallen about from 1.056 to 1.015, which is an apparent attenuation of only 72 percent. I've witnessed very little fermentation activity so far (maybe a little bubble every few minutes), but I know the yeast working, and will let it have all the time it wants. I decided that with this batch of Saison I would let the yeast express itself and not add any spices. With this in mind, I tasted the beer out of the primary and was rather impressed. The beer was a very hazy orange color with an aroma that was phenolic at first, but then fruity. I didn't detect anything overtly funky. The taste was mostly a touch sweet up front and rather juicy (a touch too full for the style; not surprising at this at this point), with a very mildy bitter and peppery finish. I'm sure the flavors will change quite a bit in the coming weeks and months. Well the Belgian Pale is acting more like a well-attenuated Biere de Garde these days. I guess you're not going to have Biere de Garde without several weeks of "guarding" or about 10 weeks to be more precise. This beer is finally looking and tasting more like a real Belgian Ale and I'm quite pleased. 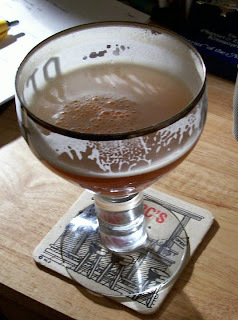 (I thought it looked darn pretty in my Orval glass pictured below.) It's too bad I've already consumed half the batch! I'm always to eager to start drinking my best beers. At least now I know that I need to be more patient with this recipe; Belgian yeasts work their magic very slowly. Anyhow, this beer definitely has that soft Biere de Garde character with a touch of biscuity-caramel-cookie sort of malt character. I could only be happier if had another case of the stuff. Also, I brewed a Saison-type beer this past weekend. It's a very simple extract-based batch. I used five pounds of Briess Pilsner dry malt extract, three pounds of Pilsner malt, a half pound Belgian Caravienne, two ounces of Kent Goldings, an ounce of Saaz hops and yeast. I didn't use any spices this time. (I usually add spices to my Saisons.) The beer has been fermenting since Sunday and is slowing down in its primary fermentation. I will be racking it out of its plastic into a glass carboy soon. I'm thinking of blending in a bottle of Saison DuPont a few days before bottling time, since I'm sort of modeling this beer on DuPont. I'm really shooting for a well-attenuated, "simply complex" beer with plenty of carbonation. Getting the gravity down low will be the trick and I think adding a bottle of the real thing might do it. I decided not use the grain bag for this batch of beer and instead mashed the loose grains in a separate pot which I kept warm inside an oven set to warm. "Lautering" was accomplished by literally dumping the grain into a large colander situated over the brew kettle. Sparging was accomplished by ladling the hot sparge water over the grain. I did not recirculate the wort. Once I had I my wort I added the Briess dry extract an ounce of the Kent Goldings pellets, which I added again 30 minutes into the boil. Finally, I added an ounce of Czech Saaz hops in plug form as an aroma hop two minutes before the end of the boil. After cooling the beer with my wort chiller, I pitched an XL pack of Wyeast #3724 Farmhouse Ale, which I hope to repitch into another batch after the secondary fermentation. Well, I decided to go ahead and bottle the blonde ale (see earlier posts) in two Party Pigs. I let one of the pigs sit for a little more than a week before tapping it. It looked darn good; clear, with the right amount of carbonation and a nice white, long-lasting head. The aroma was malty, but with a hint of green apple. "Uh, oh", I said to myself, suspecting an acetaldehyde in my beer. The taste of the beer seemed off too, a bit too sweet for my tastes, and with a bit of an odd "plastic" taste in the finish. It looked darn good though, which has left me lagering the little piggy in the fridge, hoping that the off flavors dissipate over time. The beer looked ready. The airlock was silent and showed no activity for several minutes. I peaked under the lid of my primary fermenter and the krausen had fallen and the beer looked clear. I poured a sample and it tasted good. However, when I took a hydrometer reading the beer was NOT done -- my readings went from 1.052 to 1.018 -- which is about 63-64 percent attenuated and my yeast, Safale S-04, should get me to at least 70 percent. Since the Party Pig people say that you shouldn't put beer in a pig until the gravity is below 1.018, I decided to rack the beer into a carboy. So what happened? I'm not sure, but I think the cold temperatures of the last few days (days in 30s and nights in 20s) might have something to do with it. I'm hoping that I see some changes in few days. I've got blonde ale fermenting with Safale S-04 and at high krausen, the fermentation lock got clogged and the yeast activity blew the lid off the fermenter. Now that's a healthy fermentation! This is a simple beer that is all extract, most of it added towards the end of the boil to avoid excessive caramelization of the wort. I used Simcoe hops (but rather judiciously at about 20-25 IBUs with an original gravity between 12 and 13 Plato). The bulk of the extract I used (and added a the end of the boil) was Williams Maris Otter liquid extract. I've brewed all grain before with Maris Otter, so I'm curious if I can notice a signature "Maris Otter" flavor in this beer, which I guess is a hybrid English-American blonde ale. Also, I recently discovered a case of homebrew that I had secreted away for the last eight months. (I outsmarted myself by labeling the box "empty bottles".) Anyhow, this beer that I found was my Autumnal Ale, which I brewed last August. It was light brown, spiced ale fermented with Wyeast 3725 Biere de Garde in the primary and Safale T-58 right before bottling, which made the beer very dry. It has turned out at least as good as the version I did in 2004, even though I changed the spices -- using fenugreek, cardamom and black pepper. It's an odd combination, but I think it works -- the beer is rather tasty! Well, what I'm now calling a Belgian Pale Ale has been bottled. Nothing too special to report, except that I switched sanitizers for this batch and used One Step instead of iodophor. I have a feeling that I'll switch back, as the One Step seemed NOT to dissolve very well. I had a good yield on this batch, as I filled two cases of 22-ounce bottles. Something else to note about this batch is that I primed with dry malt extract instead of corn sugar. I think this beer could turn out to be quite tasty; like a drier, slightly hoppier version of Fat Tire form New Belgium. When sampled from the secondary, this beer poured a hazy amber (sort of the color of Orval) with a strong, but pleasant phenolic aroma. The malt flavors mix well; biscuit and cookie-like tastes mix with caramel and play well wtih the anise-like hops and some tropical fruit esters. Finish is dry and a bit bitter. Belgian Pale Ale or phenolic Biere de Garde? Biere de Garde or B.P.A.? 0.50 oz. Northern Brewer pellets for 60 min. 0.25 oz. Northern Brewer pellets for 30 min. 1.00 oz. Strisselspalt whole hops for 5 min. Now, the idea here is that I brew a lower gravity Biere de Garde (say 1.060 or so) and then I brew a strong Triple and rack the wort on top of the yeast from the BDG. I guess I'm just concerned that my BDG is going to turn into a rather bland Belgian Pale Ale. I probably should relax and not worry. I've brewed a beer I'm calling an American Bitter. I did a partial mash with Briess two-row barley, 10L crystal malt, Alexander's Pale Malt Extract and some Simcoe hop pellets, along with some Burton water salts. I fermented this with Fermentis S-04 yeast. Why am I calling it an American Bitter? Well, the beer was brewed to pretty low gravity of 1.040 (a session ale) with English (Whitbread) yeast and Burton water salts, but with American hops and an aggressive hopping rate of 44 IBUs -- an Americanized version bitter -- don't you think? I racked the beer to two Party Pigs last night straight from the primary fermenter along with no more than a quarter-ounce of hop pellets in each vessel. This beer is certainly the lightest-colored beer I've ever brewed. I achieved this light color using a "late extract" process (doing a partial mash, boiling the resulting wort and adding extract in the last five minutes of the boil). This is the second batch I've brewed using this method with apparent success. Now, I'm hoping the ale conditions well in the Pigs and turns out as tasty as it was from the fermenter. I'm not sure what my next batch will be; I still have at least a case of IPA left and some of my Autumnal Ale (strong maple brown) that I brewed back in August of last year.